Don't be fooled by the whimsy of the wine names, they belie Judy's commitment to the vineyards and to making exceptional wines. Judy is focused on making wine from locally-sourced grapes grown in the Lake Chelan Valley, helping to define the terroir of this new wine growing region. She has a Master of Science degree in Zoology from the University of Connecticut Ecology and Evolutionary Biology Department and retired from her corporate career in research and development at Pfizer, Inc. Judy completed the Winemaking Certificate program at the UC Davis and is past president of the Lake Chelan Wine Growers Association. Judy is an active member of the community and supports local charity events in addition to being the co-founder of the annual Lake Chelan Swim. Don is one of the pioneers in the development of our estate vineyards here on the North Shore. His passion for land stewardship has resulted the first certified LIVE and Salmon-Safe vineyard in north central Washington. He works his magic there and oversees 28 acres of 10 different varietals. Believing that estate grown grapes allows us to differentiate the Lake Chelan terrior and create wines of exceptional quality. These two vineyards, Glacial Gravels and Gary's are farmed using sustainable viticulture, committed to the long-term viability of the winemaking industry in Lake Chelan Valley. He has a Master’s Degree in Civil Engineering from Washington State University specializing in water resources. Don is President of the Lake Chelan Wine Alliance. The wine making philosophy at Hard Row can be described as expression of terroir. 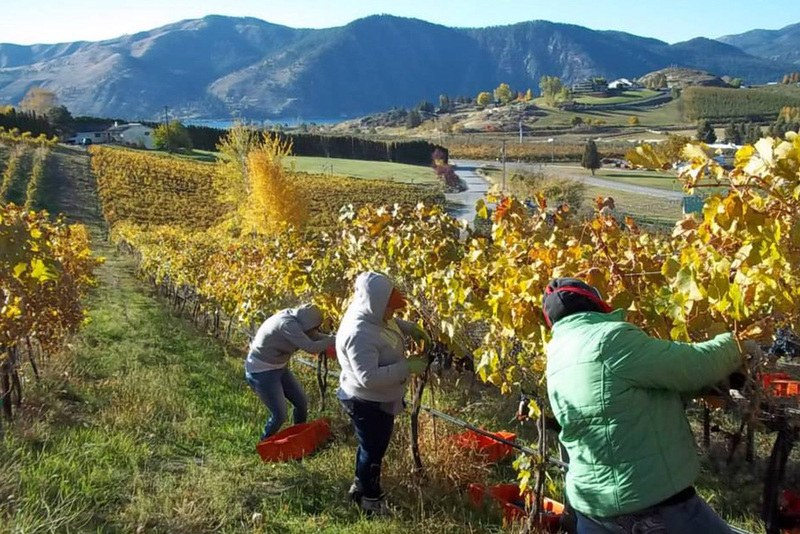 Wine is made using locally-sourced grapes from vineyards in the Lake Chelan Valley. Each bottle tells the distinctive story of its origins - the soil, the style, the vineyard, the grape and the vintage and is made to express these characteristics. No one lights up the tasting room like Danielle with her welcoming personality and contagious smile. She is the ultimate tasting room hostess from the moment guests walk in the door to the moment they leave she makes everyone’s experience a memorable and fun one. Danielle has a Bachelor of Business Administration degree with an emphasis in Accounting and an Associate's Degree in Applied Sciences in Accounting. Not only does Danielle manage the tasting room but she also manages the wine club making sure it runs smoothly and that our customers have the best possible experience when they visit. Julian’s passion for winemaking is evident from the excellent results you find in the bottle. He is a big reason why our wines are so good. Julian was studying Computer Science at University of Washington but decided in his Senior year that it was not for him. He landed a job as a cellar hand with Chris Gorman in Woodinville and has gone on to work harvests with Molly Dooker Wines in Australia and with Waiheke Island Wines in New Zealand. He brings his skills and talent to Hard Row where is has been working along side his winemaking mother, Judy Phelps since 2015. His attention to detail and excellence with all things in the cellar are what makes him so special. Julian is an avid fly fisherman and likes to cook, especially barbeque and smoked meats. We would not be a success without our exceptional, seasonal and long-term team members that include the following. Enrique Hernandez and his vineyard team that toil during the growing season and at harvest time to make sure we have the best grapes in the valley! John Apro as Lake Chelan tasting room associate and outside sales, Laura Blake and Connie Harper as seasonal tasting room associates. These folks are passionate and knowledgeable about wine and are responsible for your exceptional tasting room experience.